It’s hard work publishing our own book and making sure it’s perfect, and there are days when we wonder whether we have the energy to carry forth and figure out the mysteries of text versus image files, the distribution process, and why sometimes it takes so long to do what seems like an easy thing, why problems that were fixed a few hundred books ago are now cropping up again. So it’s wonderful to see this image. We are so grateful for the support of so many (particularly our own family members who contributed their time and effort – a couple of husbands come to mind), and for our fine writers. This has truly been a labor of love. Upcoming events can be found on the right side of this blog, and at our website. 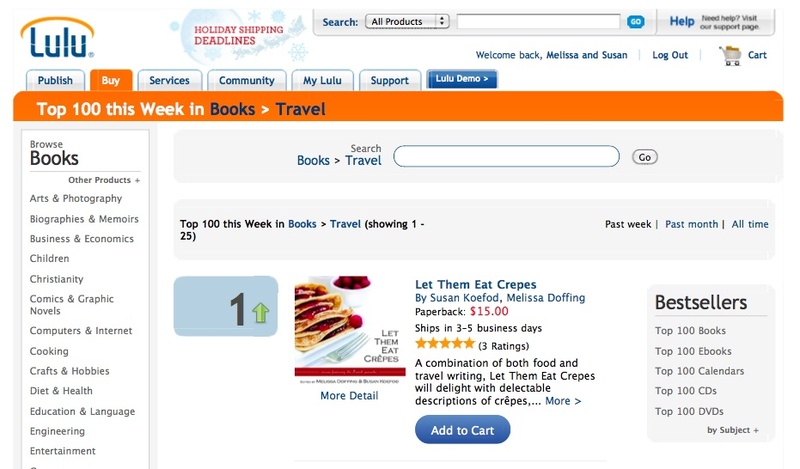 ← >Let Them Eat Crepes is #2 in Travel, #97 overall in lulu sales rankings!